Among federal inspectors' findings: Some tunnels are completely dark, which could make emergency evacuations difficult; whack-a-mole efforts to contain water leaks are only partially making progress with some steady flows remaining, and work zone safety and power alarms are not always properly addressed. WASHINGTON — Across the Metro system, some tunnels are completely dark, which could make emergency evacuations difficult. Whack-a-mole efforts to contain water leaks are only partially making progress with some steady flows remaining, and work zone safety and power alarms are not always properly addressed. Those are just some of the findings in the May, June and July Federal Transit Administration inspection reports, which have just been made publicly available. July 31 near Forest Glen. On June 23, new LED tunnel lights were not working yet near Rosslyn. In addition to these ongoing lighting problems, tripping hazards — ranging from extra rail sitting along the tracks or cables or electrical boxes knocked off the wall — remain in a few spots. As Metro addressed a number of water leaks, others either cropped up or continued to flow from tunnel walls and ceilings in various parts of the system. The FTA also checked a number of Metro power facilities, finding alarms flashing, expired fire extinguishers and, in some cases water or mold. Train control system testing meant to prevent crashes largely went well, though, although one set of tests was not completed in the middle of the day due to track access issues as trains continued to come through. 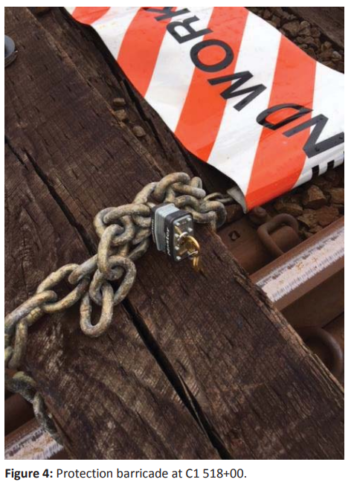 In track work observations, federal inspectors found a Metro contractor improperly installing rail clips on May 26. In June, inspectors found those same clips improperly installed elsewhere. While federal inspectors found a number of issues that have been addressed, Metro still has 979 open remedial actions identified for fixes by the FTA. Any remaining issues the FTA is tracking as part of its oversight are due to become the responsibility of the new Metrorail Safety Commission next year. From the first round of 24/7 work zones alone, seven directed actions remain open more than a year after the last of those work zones ended. This latest round of inspection reports covered only the initial setup of one of this summer’s 24/7 work zones, finding no significant problems in a few early checks of the Red Line shutdown area. Metro has 109 broader corrective action plans meant to address more systemic issues that are past due, 26 not yet due and 154 that have been closed. Some of those still open are meant to address worker safety on the tracks. Federal inspectors found the locations of work zones not always properly identified, continued incidents of trains speeding past workers on the tracks, and work zones that did not have proper protections. In another case, a welding crew did not have proper permitting and awareness of training. Metro is in the midst of a safety stand-down to address changes to standard worker protection rules. A new permanent order dated Sept. 19 raises the speed limit for trains passing work crews from 10 mph to 15 mph, which could speed up some trips for riders effective Nov. 1. The revision of roadway worker protection rules, though, also more clearly outlines a revised list of the most dangerous spots in the system for workers to be on the tracks including locations where trains must be stopped until workers can clear the area. In the new inspection reports, FTA inspectors found at least one work crew leader using an outdated version of that guide. Other changes will allow Metro to use contractors to warn train operators of work crews on the tracks ahead, and to change the word to be used over the radio to “emergency” rather than “urgent” in the most serious situations; train operators will also no longer be required to sound the train’s horn when entering and exiting a tunnel unless they have been told workers may be on the tracks ahead. That change to horn use should help address some neighbors’ concerns about noise.